Each year, L-Tron attends the LEIM (Law Enforcement Information Management) Conference, which is now called the IACP (International Association of Police Chiefs) Technology Conference. This year, the IACP Technology Conference is being held in St.Louis, MO. 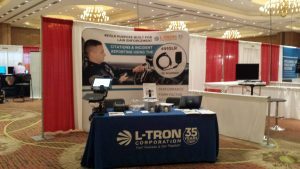 L-Tron team members Julianne & Charlie will be in attendance to meet with Law Enforcement Officers, show a small selection of L-Tron’s technology offerings (including mobile printers, mounts, and several new & upcoming products) and answer questions about L-Tron’s 4910LR DL Reader. The IACP Technology Conference runs from May 22nd to May 24th 2017. The IACP’s primary goals are to advance the science and art of police services, improve technical, administrative and operational practices, foster cooperation, and encourage the adherence of all Officers to high professional standards. The IACP was founded in 1893 and continues to serve agencies internationally. The 2017 IACP Technology Conference marks the 41st year the event has occurred, with attendance continuing to grow each year. L-Tron is looking forward to meeting new Law Enforcement and IT professionals, and sharing our knowledge of eCitation with the IACP community. Look for us at booth #600.